Today, Opera 42 lands in the beta channel, with a currency converter, personal newsreader improvements and even smarter startup. 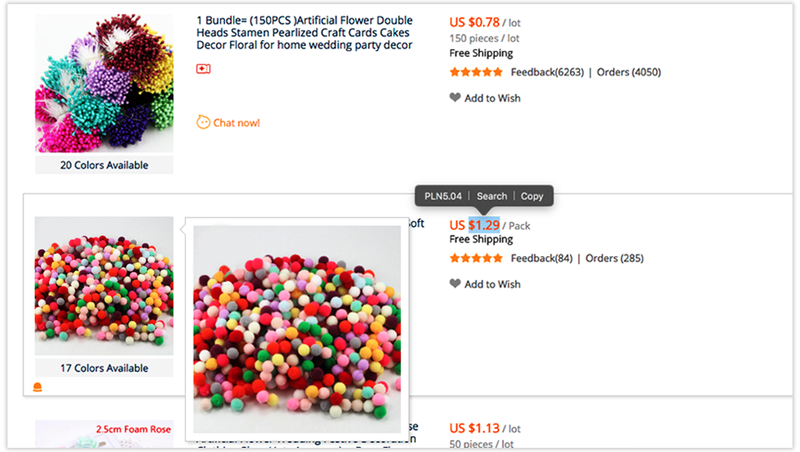 We love shopping online, but sometimes the price can be in a different currency. Opera 42 beta is the first major browser with an integrated currency converter, making it super easy to check what items cost. To use the currency converter, simply select the price you want to convert on the page and Opera will automatically show it in your local currency. You can also change your output currency in settings. Opera 42 supports converting from 32 currencies based on daily values from the European Central Bank. 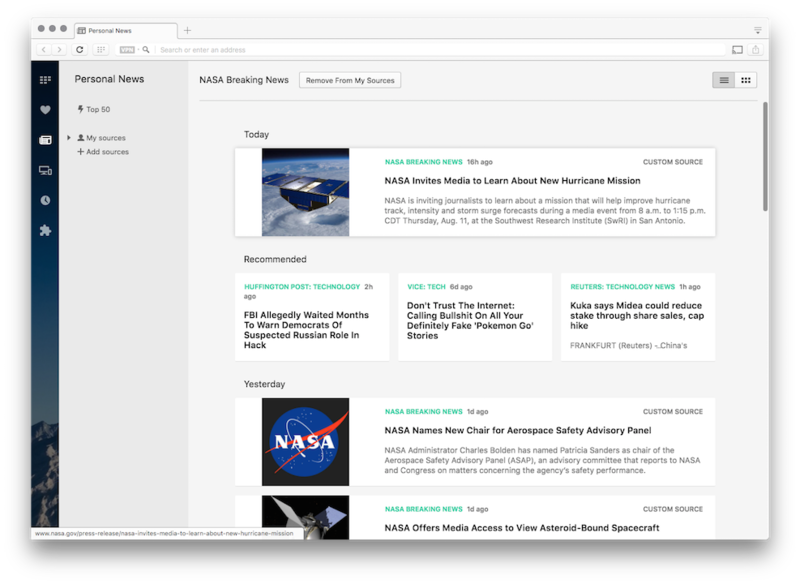 In this beta version, discovering feeds is even easier. If a page publishes web feed, a little newspaper icon will appear in the address bar. Click it and select one to open. If you find it interesting, you can always add it to your existing sources. If you’d prefer to keep your address bar clean and simple, just go to settings and disable this feature. Once you have your favorite sources configured, you can get a notification whenever there’s a new content. If that happens, a blue dot will appear over the newspaper icon (on the left of the navigation bar). You can configure the frequency of content checking in settings, or disable it completely. 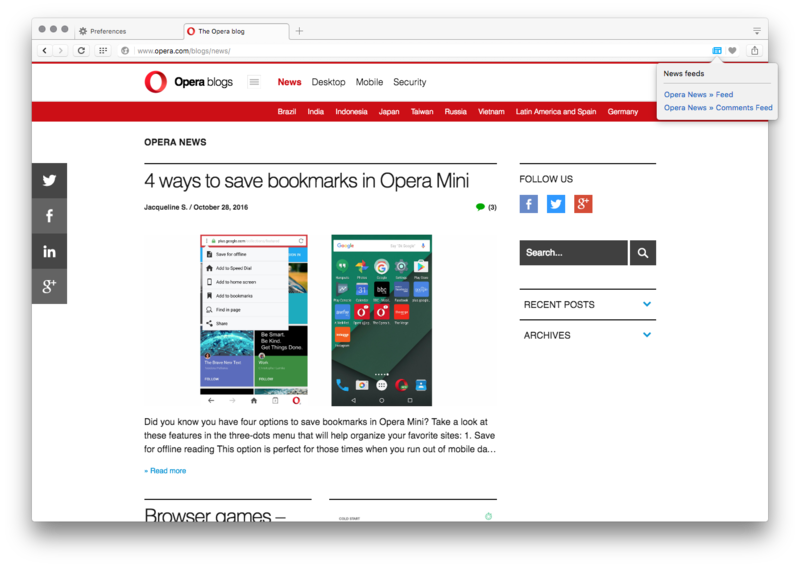 Opera’s faster startup mechanism, introduced in Opera 41, tries to determine which tabs are most important to have available, and starts loading those tabs in the background at startup. In Opera 42 beta, we now take into account which tabs were most recently used before you quit Opera, instead of relying on the order of tabs to determine which ones to load on startup. We’ve also provided a number of usability enhancements, i.e. simplified bookmarks structure and different logic for showing sync and tabs icons. Also, some some pop-outs and hints that were shown for first-time users have been removed. We hope that you will find these small improvements helpful. If you ever encountered the “Sorry, come back later and try again” problem with your web application due to a poor internet connection, you know how frustrating it can be. Especially when you are trying to send a message or perform some other action and you need to constantly check if the web is back. The solution is the background sync method, now supported in Opera 42 beta. It enables web applications to synchronize data in the background. The push notifications technique allows your website to send notifications to people even when they are not browsing your website. You can configure your Speed Dial navigation bar by the context menu. Just right-click the sidebar and configure which menu items you want visible. “Click to play” cannot be selected in settings. Crash after double click on video detach icon (OS X only).